It’s my niece’s 5th birthday when I made pop cakes for the first time. I wasn’t much skilled in making these fun treats and guess what? It was a total disaster! And of course, I was a broken heart after doing all those rolling, dipping and freezing. And all went in vain! So I started going through a lot of recipe books and online tutorials. When I applied some tricks in my recipe, these pops turned out to be something whimsical! Read our Cake Pop Maker buying guide. So here are the facts those will make your cake pops not just easy but also fun. Let’s divide the whole process into three major segments. It’ll make things easier for you to remember and proceed accordingly. These segments are- baking, rolling and dipping. First, Take a 9 x 13 pan for making the cake. You can also spray some bake-spray on the cake pan so that your cake doesn’t stick to it. It’s all up to you which flavor you want to choose. It may be vanilla or chocolate. But the sour cream of white almond is my personal favorite. Also, add other necessary ingredients. My recipe requires 7-8 cups of batter. Now put it in the microwave at a certain temperature. Wait until it’s completely baked. Bring the pan out of the oven when the baking is done. Then let it cool down. Then cut the cake into 4 equal square parts by using a knife. My recipe yields 12 pops from each of the quarter. So total 48 cake pops are produced from one pan. Confused of Muffin Pan or Cupcake Pan? Read this article. But the number of cake pops that each cake pan yields can differ depending on the type of batter you use. So regarding the quality of batter, this number can be 15 pops for each quarter or 60 for the whole pan. Remove the cake, quarter or the entire one, as you require, from the pan and finish cooling. Tip: don’t forget to note down the quantity of your recipe when you’re making cake pops the first time. It’ll help you modifying and correcting the recipe in future. The outer edge of the cake is responsible for creating hard lumps inside the cake pops. So remove them first. I usually cut one piece into four small pieces. Then take two pieces of cakes in your palms. Now rub the pieces together to make fine crumbs and collect them in a bowl. You can also use forks to crumble them. You can either use homemade icing or buy canned icing. As a first timer, I recommend you to use canned icing. As this is very moist, so use less than 1/4th of the can of frosting. This amount can vary regarding the moisture of your recipe. Spread the frosting on the crumbs evenly and then mix it. You can use the back of a teaspoon to smash the crumbs. Mix it so that the crumbs and the icing together become pulpier. Note: It’s super important not to make it moister than what it requires only to roll them into balls. Adding too much frosting can create unpleasant texture. Using hand for mixing them is always better. Use small scoop so that the round shape of cake pops remains consistent. A ¾ tablespoon size of scoop will work perfectly. Now scoop enough mixture to make a round cake pop. Again, use your hand palm to create ball shapes out of the mixture. Keep rolling the balls applying a firm pressure until you’re satisfied with their shapes. Tips: while making small balls with your hand, frequently moisten the palms with water. Wet palms will give smooth exterior surfaces on the balls and also give them uniform shapes. Now place the balls on a cookie sheet and cover them with a plastic foil. Then place them in the refrigerator for not less than 4 hours. If the ball doesn’t fall off the sticks easily, that means they aren’t firm enough. In that case, keep them in the refrigerator overnight which will do the rest firming up. Take the candy melts into a bowl. The bowl must be of a shape that you can dip the stick straight down so that the whole pop covers with chocolate. Or you can use a deep narrow cup. What type of chocolate you choose also matters a lot. Choose one that will make sure that your cake pop won’t fall off while dipping. You can add some candy color in the melted chocolate if you want. Dip one end of the stick up to one inch. Now push the middle of the cake ball into the chocolate-dipped side of the stick. Now dip the cake pop into the melted chocolate so that the chocolate covers the entire body of the ball. It’s wise to dip it straight up to the joint of the ball and the stick. Now hold the stick sideways over the chocolate bowl. Then slowly rotate it so that the excess chocolate drips off. When you think it’s enough dripping, turn the pop upside. Hold it like this for a few moments and allow it to dry. Now clear off excess chocolate from the body of the pop with your finger for a smooth look. By using a skewer, drill holes in a foam holder and place the sticks into the foam block. Keep them there for drying. Congratulation, you’re done making cake pops! Though my first experience doesn’t tell it, what I found later is that cake pops are amazing. Preparing it doesn’t even require any cutting or serving. It’s no mess and the best part is that NO leftovers. 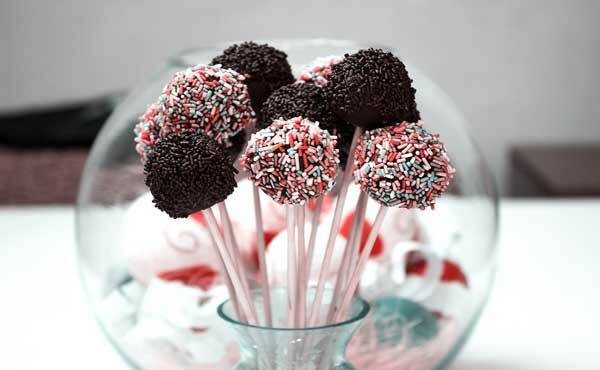 Once you get the tricks, it’s no trouble to prepare cake pops for a birthday party or shower like programs. Wish you a happy caking!